Minikin was among Tigers’ try scorers when they hit back from 20-4 down to send last week’s derby at Leeds Rhinos into extra-time. Rhinos snatched victory with a golden point drop goal, but Minikin reckons if Tigers play like they did after the break for a full game they will beat most teams. “In the second half we came out and played our game, stuck to our game plan and went pretty well and almost pinched it at the end,” he said of Castleford’s remarkable fightback. Keeping Rhinos’ left-centre Konrad Hurrell in check is a difficult proposition for anyone and Minikin feels he has learned a lesson in how to cope with big, powerful opponents. “I don’t think I made it any easier for myself,” he conceded. “I made a few bad decisions; personally I need to be massively better and as a whole we need to be better. “Defensively I have a lot to work on, coming up against blokes like Hurrell. The tough game last week has not knocked Minikin’s determination to establish himself as a specialist centre. 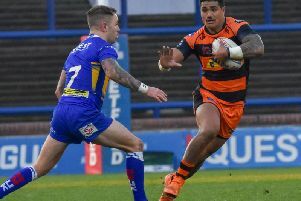 Tigers have a short turnaround to Friday’s visit of Wigan Warriors and Minikin said: “That’s the beauty of rugby league, you get to go again and right your wrongs the week after. “We had a poor performance against St Helens and then another poor first half so we will definitely be looking to fix that up against Wigan.